Hell’s Belles: Held Over Through June 29! Holy samolians: HELL’S BELLES has been held over through June 29! That means you’ve got two more chances to see Running With Scissors’ original comedy that the critics are raving about! As a special treat, company member Richard Read will appear in the role of Major Ashley Wood for the final two performances on June 28 and 29. Richard is usually reluctant to set foot onstage, so as one of our cast members put it, “this is like someone offering you a chance to spot a unicorn”. Which would be a fair assessment, if only unicorns looked like beardy gay guys paralyzed by stage fright. Come see the hilarity at Mid-City Theatre! You can purchase tickets by clicking here or by calling 504-488-1460. Note: Our opening performance on Friday, June 7 is hosted by the Mystic Krewe of Satyricon! For tickets to that show only, please call 504-252-5476. Join Running With Scissors as they travel back in time to the Civil War, to the crumbling, dilapidated mansion that houses the French Finishing School for Little Confederate Women. Once a font of gentility and etiquette, it’s now little more than a reform school, chock-full of the bawdiest, cattiest, downright orneriest gals (Kyle Daigrepont, Lisa Picone, Dorian Rush) the South has ever seen, lorded over by spinster sisters Flossie and Fannie French (Brian Peterson, Yvette Hargis)! Into their midst stumbles a seemingly innocent Union soldier (Jack Long), wounded at a nearby battle. He’s taken in and nursed, but what will all those women do with him when he’s well enough to walk again? Will he make it out alive? Will they? HELL’S BELLES is Southern Gothic at its sassiest. HELL’S BELLES runs Fridays and Saturdays at 8pm and Sundays at 6pm from June 7 – 23. Tickets are $25 on Fridays and Saturdays, and $20 on Sundays. Reserve yours today by visiting MidCityTheatre.com or calling 504-488-1460. THREE SHOWS ONLY: MARCH 15 – 17, 2013! 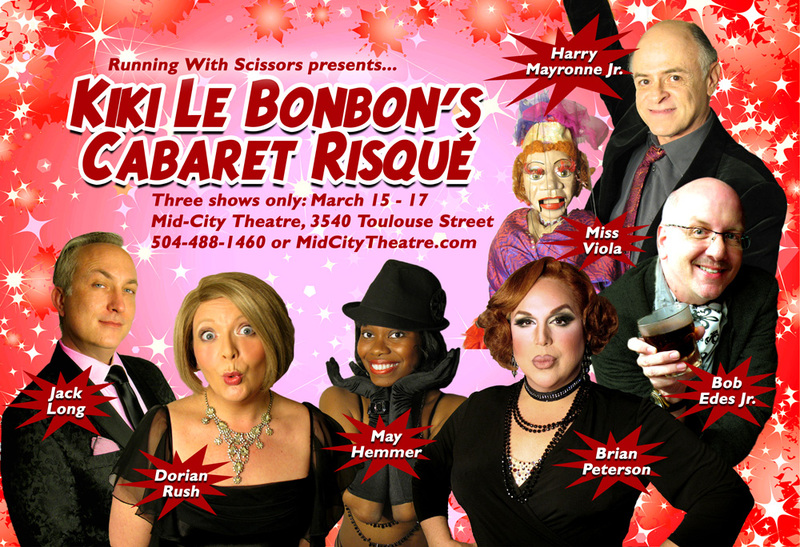 Join Running With Scissors’ cast of theatre misfits as they visit the racy, lacy boudoir/cabaret of taste-maker extraordinare, Kiki Le Bonbon. You’ll guffaw, gasp, and blush as Bob Edes Jr., May Hemmer, Jack Long, Harry Mayronne Jr., Brian Peterson, Dorian Rush, and Miss Viola show off their huge…talents. We’ll dance, we’ll sing, we’ll tell some dirty jokes, and if you’re very, very good, we’ll even read some bedtime stories. For three special nights, we’re going to let it all hang out! As you’ve probably figured out, we’re not able to do our annual holiday show, GRENADINE MCGUNKLE’S DOUBLE-WIDE CHRISTMAS, this year. (New Orleans could use a few more venues, hint, hint!) But that doesn’t mean that Running With Scissors’ cast and crew are sitting at home, twiddling their thumbs, watching re-runs of Hee-Haw, and dreaming of what might’ve been! Kyle Daigrepont & Lisa Picone are trodding the boards and hauling in the laughs in THE PECAN CRACKER at Rivertown Theaters for the Performing Arts. Performances run December 7 – 23, with shows at 7:30pm on Fridays and Saturdays and 2:00pm on Sundays. Please join ’em! Elizabeth Pearce just finished co-writing (with Richard Read and Allison Alsup) a field guide to drinking in French Quarter. As you might expect, she’s now busy leading entertaining, educating, intoxicating Cocktail Tours every Friday at 6:00pm. For more info and to book tickets, visit TheCocktailTour.com. Join her for a round! Brian Peterson is as busy as ever, with not one, but two shows in the works! You’ll find him first in THE PECAN CRACKER at Rivertown. Performances run December 7 – 23, with shows at 7:30pm on Fridays and Saturdays and 2:00pm on Sundays. A week after that closes, Brian shifts his attention to Mid-City Theatre, where he’ll appear alongside Jack Long, Varla Jean Merman, Ricky Graham, Michael Sullivan, and more fabulous folks for the hilarious SHUT UP, SWEET CHARLOTTE. Shows run December 29 through January 19! Richard Read is going to spend the holidays seeing his friends’ fabulous shows and generally taking it easy after a busy fall. If you want to catch him live and in person (and of course you do), come to HOME FOR THE HOLIDAYS, a concert benefiting the Daniel Price Fund for Aspiring Artists at House of Blues on Friday, December 21. And be on the lookout for a new book that Richard co-authored with Allison Alsup and fellow Scissor Elizabeth Pearce. It’s all about getting hammered in the French Quarter. Like they say: write about what you know. 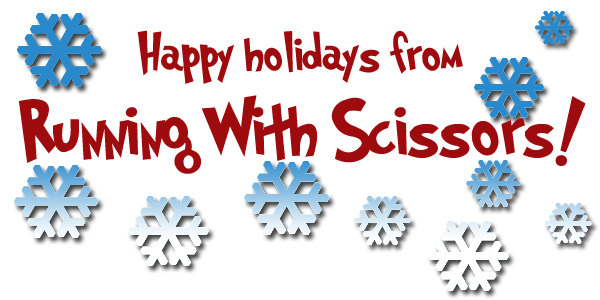 Have a very happy holiday season and a great new year. We’ll see y’all in lucky 2013! 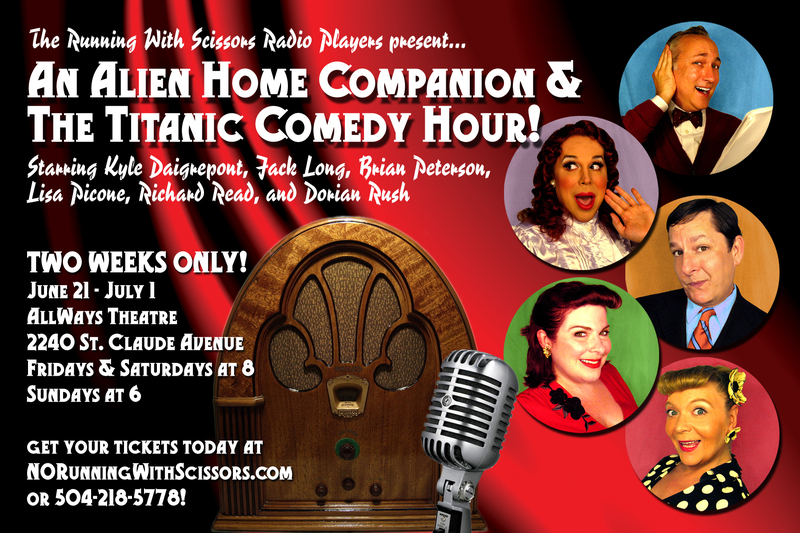 An Alien Home Companion & The Titanic Comedy Hour! AN ALIEN HOME COMPANION & THE TITANIC COMEDY HOUR stars Kyle Daigrepont, Jack Long, Brian Peterson, Lisa Picone, Richard Read, and Dorian Rush. Performances will be held at the AllWays Theatre, 2240 St. Claude Avenue, at the corner of Marigny Street. Shows run Fridays and Saturdays at 8pm and Sundays at 6pm for two weekends only: June 21 – July 1. Tickets are $20 on Fridays and Saturdays, $15 on Sundays. Note: The Mystic Krewe of Satyricon hosts an opening performance on Thursday, June 21. For tickets to that show only, please call 504 943-6910.